After months of hard work and early morning practices, the Indiana University Kokomo men’s basketball team gears up for its first home game against Bethel College on Thursday, November 17, 7 p.m., at Western High School. A pre-game party will kick off the night beginning at 5:30 p.m. at the high school, with food, fun, and music – sponsored by the IU Kokomo Alumni Association. The Cougars, led by Head Coach Jace Thompson, stand poised to make the 2011-12 inaugural campaign the first step in building a solid program for years to come. Although the Cougars are a first-year squad made up of mostly freshmen, they will be tempered by the veteran presence of guard Anthony Graves (Lake County C.C.). Graves has emerged during preseason workouts as one of the best leaders on the team, and his hard work on the court sets the example for others to follow. Coach Thompson is also quite pleased with the leadership of the freshmen as well. Brandon Larrick (Western) , Jake Robertson (Tri-Central), and Aaron Knupp (Blue River Valley) have all shown that they will be leaders of the IU Kokomo Cougars as the program continues to grow. The 2011-12 campaign will see IU Kokomo do battle against a mix of opponents, including marquee matchups against NCAA Division I Valparaiso University, and NAIA Division I St. Francis (IL). The Cougars opened the season with an 82-76 win over IU Northwest on November 1. The Cougars will take part in the 2K Sports Classic, benefitting Coaches vs. Cancer. IU Kokomo will open competition against Valparaiso University November 19 at 6 p.m., followed by a contest with the University of District of Columbia on November 20. Both games will take place on the campus of Valparaiso University. 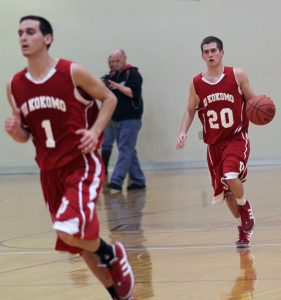 IU Kokomo will wrap up a busy November by taking part in the annual Gary Lakeshore Classic. This prestigious event, dubbed the “High School Battle of the Border” between Indiana and Illinois, will also feature two college games, with the Cougars playing against IU Northwest for the second time in 3 weeks on Saturday, November 26. Tip-off for the game will be 1 p.m. This entry was posted in Basketball, Cougars, Indiana, IU Kokomo. Bookmark the permalink.